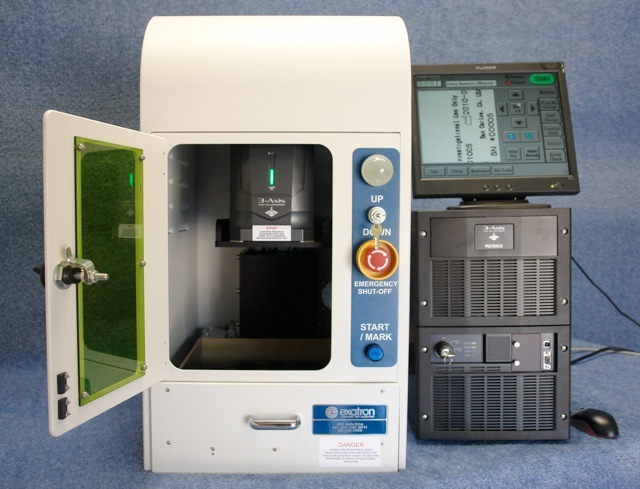 Exatron Desktop Laser Marker Systems: Exatron designs and manufactures Desktop Laser Marker Systems and enclosures featured with Keyence Lasers as shown below. 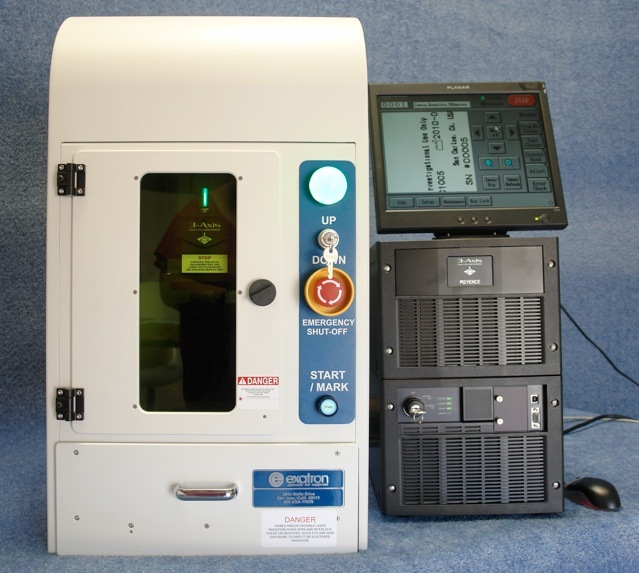 Exatron Compact tabletop Laser marking systems are designed for short runs, small lots, and prototype production for the Electronics, Medical, Aerospace, Military, Automotive, Packaging, and General Manufacturing Industries. 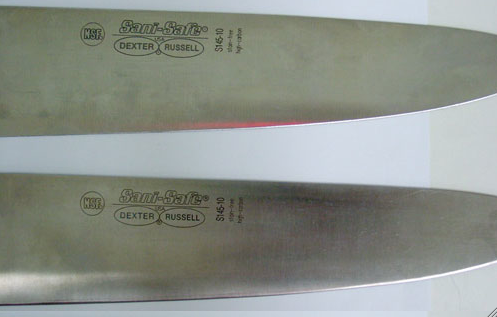 Also available, medium to production volume Laser Marking with additional full automation utilizing all Laser Vendors. Exatron Laser Enclosure Systems are designed and made in the USA • Short lead time • Masterfully Crafted • Built to Suit Your Exact Needs. Keyence Lasers are featured. Highest quality, State-of-the-Art Lasers without paying inflated European prices. 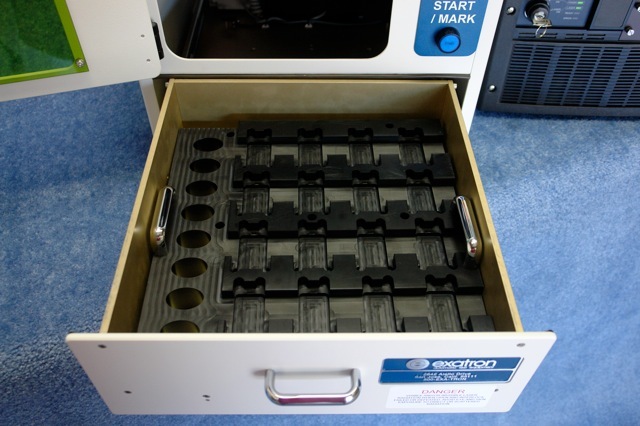 Drawer insert is machined to fit your parts exactly. The drawer can even be a Rotary Turntable instead. Just load parts and rotate to mark. Easy! Exatron works with all laser manufacturers including, but not limited to, Keyence, JDS Uniphase, Synrad, Laservall, Trumpf, Rofin, RMI, Unitek Miyachi, and many others. We can select the laser that is best for your application, or you can suggest the laser vendor you prefer. 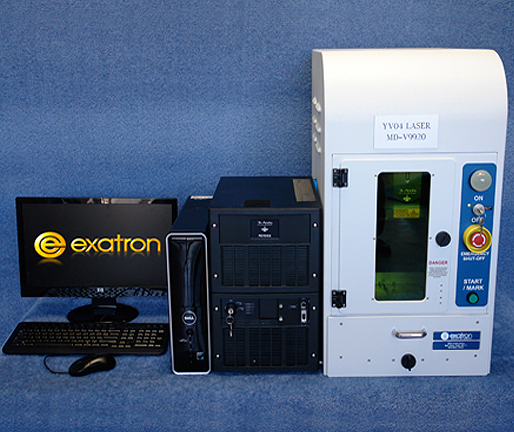 Exatron will integrate that laser into a finely crafted laser enclosure with the mechanical and software requirements to suit your needs and applications. 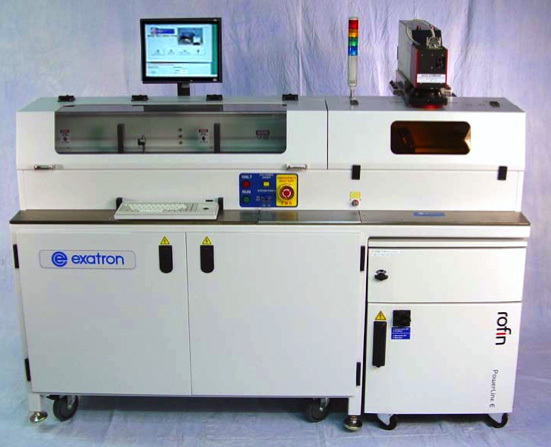 Exatron is an Industry Leader in Laser Marker Automation and Integration. 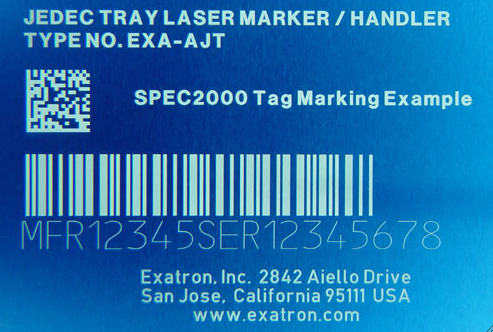 Exatron with over 30 years experience in standard and custom laser marking automation and hundreds of systems in the field marking a very wide variety of items. 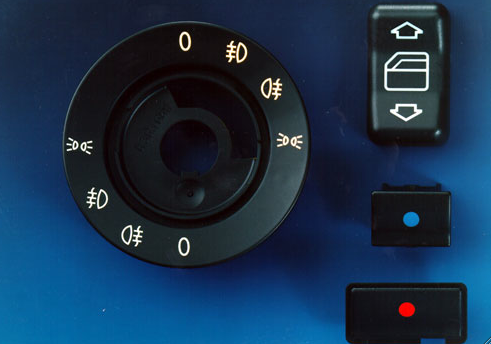 Our experience is in marking for Electronics, Medical, Automotive and General Industrial marking. 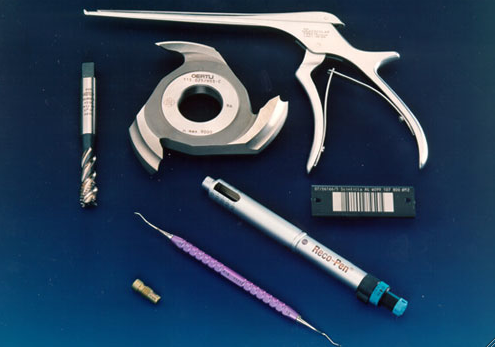 Plastics, metals, ceramics, and exotic materials are all well within our experience. 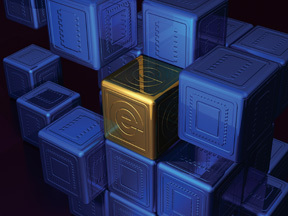 Exatron also offers a unique service in the industry. 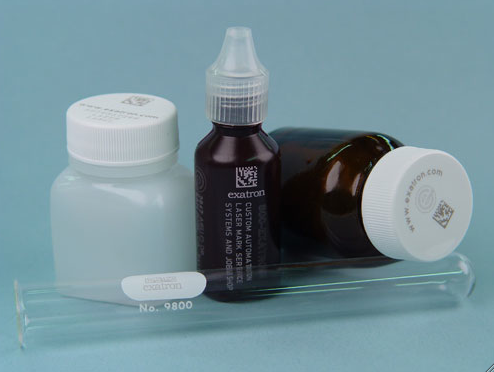 We offer a single point of contact for the customer, but we can have samples made by many different laser vendors. 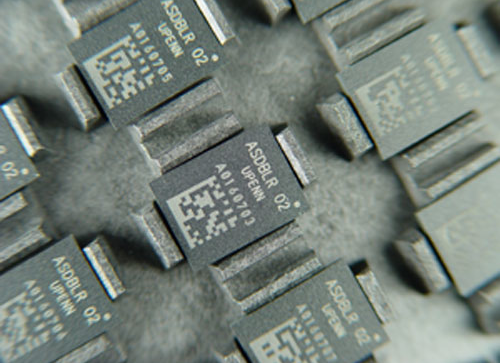 Most suppliers will show you samples from one or two lasers  we can show you samples from as many as a dozen. Exatron also manufactures large, high volume laser marker systems that are incorporated with any type of automation, including pick and place handlers, rotary handlers, gravity feed and bowl feed handlers, with hot cold and ambient testing, electrical testing, lead forming and straightening and sophisticated software that puts it all together. See 8000 series. Exatron = Made in the USA with high quality, pride, and over 40 years experience.